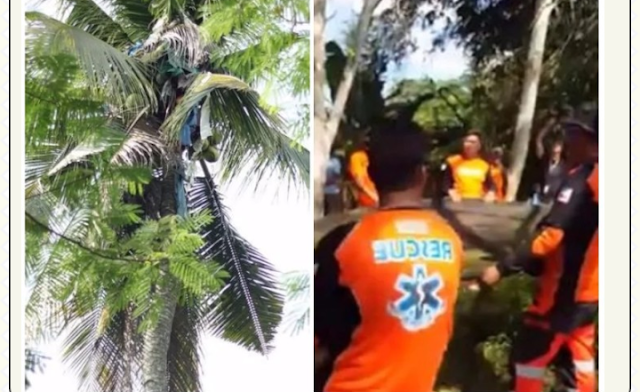 A Philippine man who has been living on top of tree for three years finally comes back to earth after local authorities intervened. Gilbert Sanchez, 47, went to live on top of a 18-meter coconut tree in 2014 and has never come down despite numerous attempts by his family to convince him to come back. He was reportedly afraid that someone could kill him if he did. “One day I begged him to come down. But he told me to be quiet, and that he couldn't get down because someone wanted to kill him," says Aldrin Sanchez, his brother. Gilbert's mother, Winifreda Sanchez, was forced to start taking to him food and water everyday to save him from hunger in his heavenly home. He collected the daily food, water and some cigar supplies using an improvised rope. And when he felt like relieving himself, he did so from the tree. Gilbert's strange lifestyle soon attracted media and grabbed attention of the local authorities who then decided to work with the family to rescue him. A team of 50 men and women approached the tree top dweller to try and persuade him one more time if he could change his mind and voluntarily come back to earth. He refused. A plan was then hatched to cut the tree while trying to save him. It was a risky operation with two possible outcomes: Death or life. Fortunately, the rescue team was able to bring Gilbert back to earth.He is reportedly undergoing treatment after he was diagnosed with psychosis.